One of the most influential periods of my life was the eight years I spent in the Roman Catholic Parochial school system. Many people who attended those schools can testify that forty or fifty years ago education at the feet of the priests and nuns was often a no-nonsense affair. For the most part, the students took school seriously, mostly because the nuns knew how to instill discipline like a drill sergeant with a platoon of new recruits. As I reflect back on the many lessons I learned in those formative years, I realize that one of the most beneficial was the sense that everyone has a gift and calling or, as they said, a vocation from God. It was explained that we are all unique and that it is your responsibility to discover your vocation. Today I see more clearly, and in a much larger way, some foundational truths concerning our personal gifts and callings. 1. There is only one Body. 2. The one Body is composed of many members. 3. Each member is unique. 4. Each member is to work to benefit one another. 5. Christ is the Head of the one Body. Everyone should seek to discover their personal giftings and the role God has called them to play. However, all talk about our personal giftings and roles must be viewed in light of the understanding that there is one Body, the Body of Christ. For we were all baptized by one Spirit into one body–whether Jews or Greeks, slave or free–and we were all given the one Spirit to drink. We must never lose sight that there is only one Body. This means that every person who is born again of God’s spirit is part of this one Body, no matter what church, denomination, or group they belong to. This is the proper way to think of others who think differently about the scriptures, because it gives us the greatest opportunity to work for unity. Many Christians recognize that the one Body is composed of many members, yet from a practical standpoint this truth seems to get lost because of how people behave. One way this manifests itself is in the way we negatively judge others who differ from us, merely on the basis that they see and do things differently from us. The truth that there are many members in the Body of Christ obligates us to recognize that we are not alone. By acknowledging the many other members in the Body of Christ we give ourselves the opportunity to see a variety of perspectives besides our own. While unity is expressed through the concept of there being one Body, its diversity is celebrated through the understanding that the Body has many members. 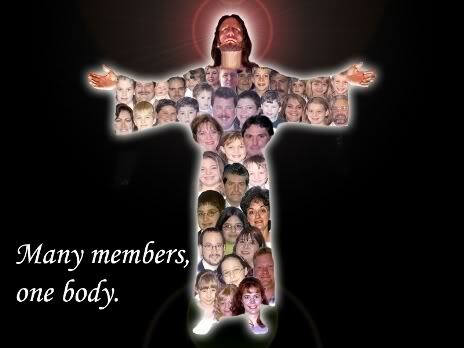 …for we are all members of one body. With this third truth, that each member is unique, I give permission to myself and others to be different in our gifts and callings. In the New Testament, there are three sections of God’s Word (Romans 12, 1 Corinthians 12, and Ephesians 4) that list various gifts. These lists are by no means exhaustive because we know that there are also those who are gifted as intercessors, dancers, worshippers, artisans, etc. In the Old Testament God even tells us how He spiritually gifted Bezalel as a craftsman with all types of artistry in metals, stone, and wood. There is no reason to believe He does not do the same today in the Body of Christ. The diversity of all the members allows for specialization in our functions (doings). Not only would it be boring, it would also be extremely tedious if we all looked alike and did the same thing. The great variety among the various members allows for each of us to pursue our passions. Having a proper understanding of this truth provides us the greatest opportunity to respect and honor everyone’s individual differences. The distinctiveness of each member creates a tapestry of color and hue. We are a kaleidoscope of grace that, through our various combinations, reveals God’s great goodness. Despite our individuality, we must work for the mutual benefit of all the members. God has given us all special gifts that we are to use to serve one another. It is because we have a variety of gifts that we can minister (serve) His grace to others in a variety of ways. A teacher provides a benefit to the Body that is very different from an intercessor, server, or administrator. Although we serve differently, our service must be for the benefit of the others, because we belong to each other. One part of the Body cannot rightly deny another part. The health of the human body is very much dependent upon all the various systems working harmoniously together. In the human body it is the responsibility of the head (brain) to coordinate the various physical, chemical, and neurological systems. In the same way, our connection to the Head, Jesus Christ, is what keeps us working in harmony. Serious problems develop in the Body of Christ whenever we lose connection with the Head. This happens whenever we turn to doing things our own way (idolatry and pride) versus following the lead of the Head. (18) Do not let anyone who delights in false humility [pride] and the worship of angels disqualify you for the prize. Such a person goes into great detail about what he has seen, and his unspiritual mind puffs him up with idle notions. (19) He has lost connection with the Head, from whom the whole body, supported and held together by its ligaments and sinews, grows as God causes it to grow. When it comes to our gifts and callings, pride cannot be given any room. This truth is made clear when God provides a fictional dialogue between body parts in 1 Corinthians 12:14-22. This section begins with the foot complaining that because it is not the hand it is not a part of the body. This is the “I’m not good enough syndrome.” This is really rooted in a devalued estimation of self, which is one way pride shows up. The other extreme is depicted when the eye says to the hand, “I don’t need you!” (1 Cor. 12:21). This is the “I’m better than you syndrome,” which is also prideful. The fact is that in the Body of Christ no one is to look up to, or down upon, another. We are all to look to Christ as the Head and work to serve one another with the gifts we have received. In an orchestra there are hundreds of individual instruments, each of which sound, look, and operate differently. Their ability to make beautiful music depends upon the musicians taking their lead from the conductor. In the same manner, in the Body of Christ our diversity can demonstrate the beauty of God’s grace when we all serve one another with our various gifts of grace, taking our lead from Christ, the Head. This entry was posted in Bible Teachings and tagged body of Christ working together, calling in christ, every memeber of body of christ important, gifts and callings in the one body, using your gifts in christ, what is my gift. Bookmark the permalink.